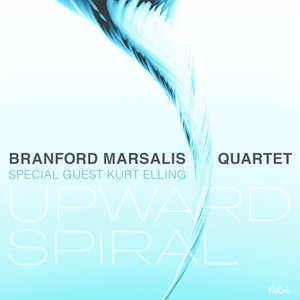 JAZZ CHILL : The Branford Marsalis Quartet Teams Up With Kurt Elling On "Upward Spiral"
The Branford Marsalis Quartet Teams Up With Kurt Elling On "Upward Spiral"
It is no secret that the Branford Marsalis Quartet can be as freewheeling off the bandstand as in performance. Saxophonist Branford Marsalis, and his Quartet made up of pianist Joey Calderazzo, bassist Eric Revis and drummer Justin Faulkner are each bold personalities with strong opinions, equally intense in both musical and verbal exchanges. “The band talks about all kinds of things, many of which are unprintable,” Marsalis admits. “But we have serious musical debates as well.” One of these exchanges led to Upward Spiral, the new album from the Branford Marsalis Quartet with special guest Kurt Elling. The album will be released via OKeh Records on June 10, 2016. What has emerged, after an intense week of performance and recording in New Orleans, is a collection that blends Songbook staples, jazz standards, and standards-to-be from a diverse array of composers.